Unfortunately, many shelters do not have the means to house companion animals and many victims are left facing the difficult decision to either leave their pets behind or remain in the abusive environment. Sadly, nearly 50% of victims have delayed leaving abusive relationships out of fear of harm to their animals. Equally disturbing, more than half of victims have reported leaving their pets with their abusers, where the pets may face torture or even death. Several organizations recognized the lifesaving urgency of this issue, and noticed that one way to address the problem was to make it easy for victims and shelter advocates to locate existing programs that can house victims’ pets. By creating this one-stop powerful search directory, we hope to make the process of locating available resources easier in a time of great distress for a victim. Another goal of SafePlaceForPets.org is to raise awareness about how easy it can be to create safe pet housing options and support family violence shelters in their efforts to do so. And lastly, by raising awareness about the issue to those concerned about domestic violence victims and pets, we want to increase access to opportunities to help create and maintain such programs. This website is brought to you by RedRover. Founded in 1987, RedRover focuses on bringing animals out of crisis and strengthening the bond between people and animals through a variety of programs, including emergency sheltering, disaster relief services, financial assistance and education. RedRover accomplishes its mission by engaging volunteers and supporters, collaborating with others and maximizing the use of online technology. ​ The National Link Coalition is an informal, multi-disciplinary collaborative network of organizations and individuals addressing public policy, programming, public awareness and research at the intersections of domestic violence, animal abuse, child maltreatment and elder abuse. The National Link Coalition created Guidelines for Directories of Domestic Violence Pet Support Programs in order to advise organizations as to how to structure and maintain their directories. 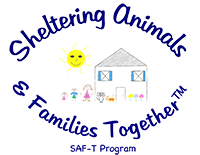 Sheltering Animals and Families Together (SAF-T) is the first and only global initiative guiding domestic violence shelters on how to house families together with their pets. SAF-T was created in recognition that families who are abused often have pets and do not wish to be separated from them when fleeing their abusive environment. The SAF-T Start-Up Manual 2012 sets forth three housing styles and answers questions about how to safely house pets on-site at a domestic violence shelter.